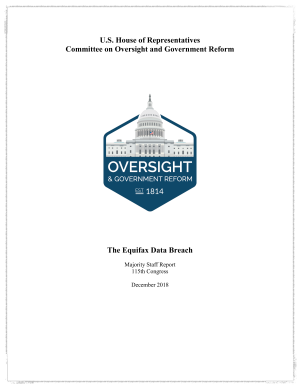 The House Oversight Committee has released a scathing report on Equifax. Through the investigation, the Committee reviewed over 122,000 pages of documents, conducted transcribed interviews with three former Equifax employees directly involved with IT, and met with numerous current and former Equifax employees, in addition to Mandiant, the forensic firm hired to conduct an investigation of the breach. It shows the 1,046 domains that have successfully activated strong protection with GCA’s DMARC tools will save an estimated $19 million to $66 million dollars from limiting BEC for the year of 2018 alone. These organizations will continue to reap that reward every year in which they maintain the deployment of DMARC. Additional savings will be realized as long as DMARC is deployed. Their press release from this morning is at here and the report download is here. There’s an interesting report out from the Cyentia Institute, which is run by Wade Baker and Jay Jacobs. (Wade and Jay were amongst the principals behind the Verizon DBIR.) It’s “The Cyber Balance Sheet.” It’s interesting research and if you spend time with executives, worth your time. I’m continuing to do research on the topic, and I’m interested in putting together a list of such things. I’d like to ask you for two favors. First, if you remember such things, can you tell me about it? I recall “Computers at Risk,” the National Cyber Leap Year report, and the Bellovin & Neumann editorial in IEEE S&P. Oh, and “The New School of Information Security.” But I’m sure there have been others. Second, I am trying to do searches such as “cites “Computers at Risk” and contains ‘NTSB’.” I have tried without luck to do this on Google Scholar, Microsoft Academic and Semantic Scholar. Only Google seems to be reliably identifying that report. Is there a good way to perform such a search? Dear Mr. President, what actions are we taking to learn from our mistakes? Do we have a repository of mistakes that have been made? Do we have a “capability” for analysis of these mistakes? Do we have a program where security experts can gain access to the repository, to learn from it? I’ve written extensively on this problem, here on this blog, and in the book from which it takes its name. We do not have a repository of mistakes. We do not have a way to learn from those mistakes. Simson Garfinkel and Heather Lipford’s Usable Security: History, Themes, and Challenges should be on the shelf of anyone who is developing software that asks people to make decisions about computer security. We have to ask people to make decisions because they have information that the computer doesn’t. My favorite example is the Windows “new network” dialog, which asks what sort of network you’re connecting to..work, home or coffee shop. The information is used to configure the firewall. My least favorite example is phishing, where people are asked to make decisions about technical minutiae before authenticating. Regardless, we are not going to entirely remove the need for people to make decisions about computer security. So we can either learn to gain their participation in more effective ways, or we can accept a very high failure rate. The former option is better, and this book is a substantial contribution. It’s common for designers to throw up their hands at these challenges, saying things like “given a choice between security and dancing babies, people will choose dancing babies every time,” or “you can’t patch human stupidity.” However, in a recently published study by Google and UCSD, they found that the best sites only fooled 45% of the people who clicked through, while overall only 13% did. (There’s a good summary of that study available.) Claiming that “people will choose dancing babies 13% of the time” just doesn’t seem like a compelling argument against trying. The “Major themes” chapter is 61 or so pages, which is over half of the 108 pages of content. (The book also has 40 pages of bibliography). Major themes include authentication, email security and PKI, anti-phishing, storage, device pairing, web privacy, policy specification, mobile, social media and security administration. The “Lessons Learned” chapter is quite solid, covering “reduce decisions,” “safe and secure defaults,” “provide users with better information, not more information,” “users require clear context to make good decisions,” “information presentation is critical” and “education works but has limits.” I have a quibble, which is Sasse’s concept of mental ‘compliance budgets’ is also important, and I wish it were given greater prominence. (My other quibble is more of a pet peeve: the term “user” where “people” would serve. Isn’t it nicer to say “people require clear context to make good decisions”?) Neither quibble should take away from my key message, which is that this is an important new book. The slim nature of the book is, I believe, an excellent usability property. The authors present what’s been done, lessons that they feel can be taken away, and move to the next topic. This lets you the reader design, build or deploy systems which help the person behind the keyboard make the decisions they want to make. To re-iterate, anyone building software that asks people to make decisions should read the lessons contained within. Disclaimer: I was paid to review a draft of this book, and my name is mentioned kindly in the acknowledgements. I am not being paid to write or post reviews. There are a number of reports out recently, breathlessly presenting their analysis of one threatening group of baddies or another. You should look at the reports for facts you can use to assess your systems, such as filenames, hashes and IP addresses. Most readers should, at most, skim their analysis of the perpetrators. Read on for why. You may get a vicarious thrill from knowing who might be attacking you, but that very vicarious thrill is likely to make those details available to your conscious mind, or anchor your attention on them, causing you to miss other attackers. Similarly, you might get attached to the details of how they attacked last year, and not notice how those details change. Now, you might think that your analysis won’t fall into those traps, but let me be clear: the largest, best-funded analysis shops in the world routinely make serious and consequential mistakes about their key areas of responsibility. The CIA didn’t predict the collapse of the Soviet Union, and it didn’t predict the rise of ISIS. If your organization believes that it’s better at intelligence analysis than the thousands of people who work in US intelligence, then please pay attention to my raised eyebrow. Maybe you should be applying that analytic awesomesauce to your core business, maybe it is your core business, or maybe you should be carefully combing through the reports and analysis to update your assessments of where these rapscallions shall strike next. Or maybe you’re over-estimating your analytic capabilities. Let me lay it out for you: the “sophisticated” attackers are using phishing to get a foothold, then dropping malware which talks to C&C servers in various ways. The phishing has three important variants you need to protect against: links to exploit web pages, documents containing exploits, and executables disguised as documents. If you can’t reliably prevent those things, detect them when you’ve missed, and respond when you discover you’ve missed, then digging into the motivations of your attackers may not be the best use of your time. The indicators that can help you find the successful attacks are an important value from these reports, and that’s what you should use them for. Don’t get distracted by the motivations. There’s a story over at Bloomberg, “Experian Customers Unsafe as Hackers Steal Credit Report Data.” And much as I enjoy picking on the credit reporting agencies, what I really want to talk about is how the story came to light. The cyberthieves broke into an employee’s computer in September 2011 and stole the password for the bank’s online account with Experian Plc, the credit reporting agency with data on more than 740 million consumers. The intruders then downloaded credit reports on 847 people, said Dana Pardee, a branch manager at the bank. They took Social Security numbers, birthdates and detailed financial data on people across the country who had never done business with Abilene Telco, which has two locations and serves a city of 117,000. The incident is one of 86 data breaches since 2006 that expose flaws in the way credit-reporting agencies protect their databases. Instead of directly targeting Experian, Equifax Inc. and TransUnion Corp., hackers are attacking affiliated businesses, such as banks, auto dealers and even a police department that rely on reporting agencies for background credit checks. There are three key lessons. The first is for those who still say “anonymized, of course.” The second is for those who are ok with naming the victims, and think we’ve mined this ore, and should move on to other things. So the first lesson is what enabled us to learn this? Obviously, it’s work by Dissent, but it’s more than that. It’s breach disclosure laws. We don’t anonymize the breaches, we report them. These sorts of random discoveries are only possible when breaches and their details are reported. We don’t know what details are important, and so ensuring that we get descriptions of what happened is highly important. From that, we discover new things. The second lesson is that this hard work is being done by volunteers, working with an emergent resource. (Dissent’s post on her work is here.) There’s lots of good questions about what a breach law should be. Some proposals for 24 hour notice appear to be being drafted by people who’ve never talked to anyone who’s investigated a breach. There are interesting questions of active investigations, or those few cases where revealing information about the breach could enable attackers to hurt others. But it seems reasonably obvious that the effort put into gathering data from many services is highly inefficient. That data ought to be available in one place, so that researchers like Dissent can spend their time learning new things. The final lesson is one that we at the New School have been talking about for a while. Public data transforms our profession and our ability to protect people. If I may borrow a line, we’re not at the beginning of the end of that process, we’re at the end of the beginning, and what comes next is going to be awesome.